Private concierge orientation, map service and sightseeing organization • Travel organization and coordination (incl. ticketing and route planning to helicopter and private jet reservations) • Transfer Service from /to port and airport (under previous arrangement) with standard or luxury options • Car & bike rental services • Private and semi-private yacht charters and sailing cruises •	Scuba diving & Snorkeling • Wine & Dine & exclusive culinary reservations • Wine tasting & Food tasting experiences • Signature Gourrmet ‘Local Flavors’ Degustation Experience • Private Cooking Lessons / Demonstration (under previous arrangement) •	Private Custom Altana dinner for two (previous arrangement is required; all food is seasonal and is custom prepared for our guests at each time) • Wedding & Vow Renewal planning & hosting • Wedding proposals planning and services • Event Planning – Team Building events/activities, cocktail parties, art exhibitions, theatre, concerts • Personalized yoga, massage and other exercise and relaxation programs. • Beauty Treatments • Free Wireless Internet in rooms and communal areas •	Laptop computers /Net-books free of charge (on request & upon availability) • Business services (fax, scanning, printing, courier correspondence) • Conference facilities (up to 16 persons) •	Breakfast served 8:30 – 12:00 (with large variety of home-made special pastries, marmalades, pies, our new Greek Breakfast option and other treats) •	Laundry service – Drying Service. Direct dial phones in all rooms • Free Wireless Internet • Safe-box • Tea making facilities with exclusive herbals • Board games • Luxury table books and other literature • CD – Mp3 players in all rooms (with iPod and iPhone docks) • Music Library with a large collection of music choices • Luxury bathroom amenities • Bathrobes and slippers • Hairdryer • Mini Bar • Indoor or outdoor Jacuzzi in suites • Air conditioning. 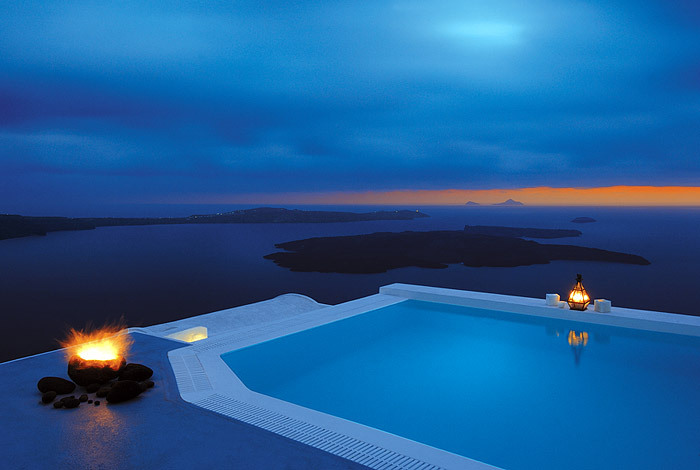 Swimming pool with Jacuzzi corner. • “Kafeneion” preserved cavehouse cafe’-bistro and cocktail bar • Large Communal veranda overlooking the Caldera (also suitable for wedding ceremonies, unique cocktail parties/bbq’s, gatherings & events). ALTANA uses its own, home grown organic vegetable and fruit produce from the Altana farm near Kouloumbos. ALTANA has a NO-TV POLICY (there are no Televisions in the rooms). ALTANA has a NO PETS POLICY (please contact the hotel for further info or exceptions).